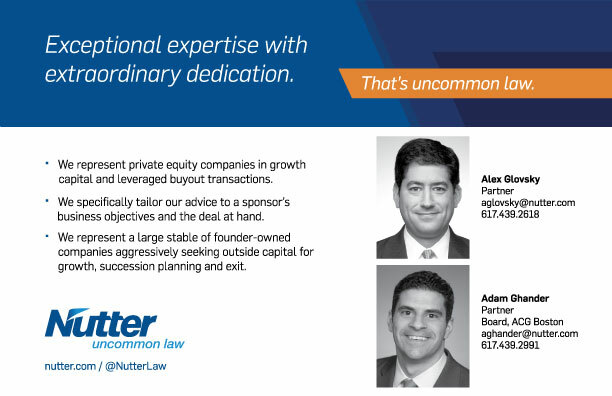 Nutter is sponsoring the ACG Boston’s DealFest Northeast on June 14. The ACG Boston DealFest is the largest M&A block party in the Northeast and top private equity and investment banking firms from all over New England will host, representing the best of the Northeast M&A community. Over 600 middle-market deal professionals—capital providers, intermediaries, corporates and strategics—from all over the country, and New England’s top private equity and investment banking firms, will network, discover new partners, and identify untapped sources of dealflow. ACG Boston, the Boston Chapter of the Association for Corporate Growth, is the premier member-based association in New England helping middle-market M&A professionals build and maintain trusted networks, facilitating relationship-building and providing deal related content to the middle-market M&A community.